Palestinian owner chef and Muslim chef cook authentic Arab Mediterranean, Japanese and Western food. Not only Muslims but non-Muslims can enjoy our food without any concern. 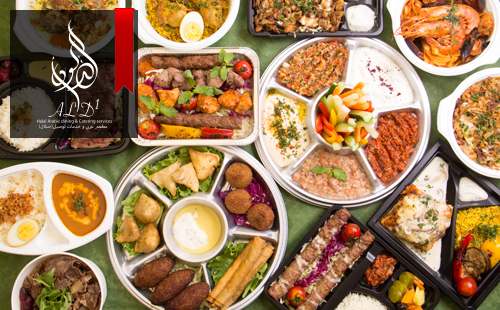 Our authentic Arabian food that our Muslim chefs cook with responsibility garner good reviews from a lot of people. We use only Halal meat and Halal ingredients. You can enjoy our original homemade dressing and sauce. Since Palestinian owner chef and Muslim chef cook genuine Arabian meals, we have clients such as Embassy of the Arab countries and Muslim VIPs. We have wide experience in large catering for parties that prime ministers and royal families from Arabian countries attends.